Hallux rigidus is a kind of arthritis that occurs when the tissues at the end of the toe bones begin to degenerate. Because it is brought on by the degeneration of tissues, hallux rigidus is known as a type of degenerative arthritis. Hallux rigidus may be more likely to develop after trauma or injury to the toe joint. Hallux rigidus most commonly occurs in adults over 30 years old. What parts of the foot are affected by hallux rigidus? The word hallux refers to the big toe, so the term hallux rigidus refers to the big toe becoming stiff or less mobile. Hallux rigidus affects the metatarsophalangeal joint, which is the joint at the bottom of the big toe. The metatarsophalangeal joint is covered in articular cartilage, which is designed to limit any painful grinding of the bones. With age, this cartilage may begin to degenerate, reducing the barrier between bones. Without a proper amount of articular cartilage, the bones of the big toe and foot may begin to grind together, causing pain and discomfort. In addition to this pain, bone spurs may also form around the metatarsophalangeal joint. The formation of these bone spurs can further restrict movement in the joint, limiting the functionality of the big toe. A possible cause of hallux rigidus includes a structural abnormality within the foot and toe that may make it more likely to develop arthritis of the big toe. As mentioned previously, degeneration of articular cartilage can also cause hallux rigidus. Hallux rigidus, which may be referred to by some as a stiff big toe or big toe arthritis, may be more common in patients with certain foot types, such as sunken arches or rolling ankles. Certain jobs that involve squatting or stooping may place additional stress on the big toe and can lead to hallux rigidus. What are the symptoms of hallux rigidus? An early symptom of hallux rigidus is discomfort or pain in the big toe that is made worse when walking, running, or standing. Cold weather may also worsen this pain and stiffness. Another common symptom is swelling or inflammation of the big toe. As hallux rigidus progresses, patients may experience worsening pain, an inability to wear shoes, and a dull ache in the hip, knee, or lower back that is a result of altering your natural walking pattern. In more severe cases of hallux rigidus, some patients may begin to limp to reduce pain, which can place stress on other parts of the body. How Can Dr. Rozbruch diagnose hallux rigidus? In many cases, Dr. Rozbruch is able to properly diagnose hallux rigidus through a physical examination of the toe and foot. X-rays of the foot and toes may be ordered to examine the extent of damage and severity of hallux rigidus. If diagnosed early, hallux rigidus may respond better to a treatment or surgery. It is important to meet with Dr. Rozbruch as soon as you become aware of any hallux rigidus symptoms. If left untreated, hallux rigidus can worsen and may lead to the growth of painful bone spurs, which can cause further discomfort. What hallux rigidus treatments are available? Dr. Rozbruch may prescribe anti-inflammatory medications to reduce any swelling or tenderness associated with hallux rigidus. Specifically designed footwear may help reduce hallux rigidus symptoms. These shoes are able to limit the amount of bending the toes do when walking, which can reduce pain and discomfort. Inserts or soles may be designed to help stabilize the metatarsophalangeal joint when walking. Cortisone injections for hallux rigidus can provide temporary relief to big toe stiffness. In some cases, Dr. Rozbruch may prescribe Cortisone injections with special footwear for the most noticeable relief from hallux rigidus symptoms. What hallux rigidus surgeries are available? For more severe symptoms, hallux rigidus surgery may be required. There are a variety of toe surgeries currently available to treat hallux rigidus. The type of hallux rigidus surgery you will undergo depends on the severity of your condition. Dr. Rozbruch will help you determine which surgery is best for your particular needs. Common hallux rigidus surgeries include cheilectomy, metatarsophalangeal joint fusion, and metatarsophalangeal joint replacement. In patients with bone spurs, cheilectomy may be suggested to remove these bony growths at the top of the joint. When bone spurs form at the top of the joint, they may be brought together when the big toe is extended. Because the big toe needs to extend when walking, these bone spurs may begin to cause pain or discomfort. These bone spurs may become irritated as they come together when the big toe is extended, which can hinder a person’s ability to walk. A cheilectomy is performed through an incision made above the metatarsophalangeal joint. Any bone spurs around the joint are removed during cheilectomy. In some cases, a small amount of bone may be shaved off to ensure that there will be no friction against the big toe bone after surgery. The incision is then closed with incisions. Metatarsophalangeal joint fusion is when 2 bones that form a joint are fused to one another to create 1 bone. Once these 2 bones have been properly fused together, the joint will no longer move when the toe extends. A shoe with a specialized sole may be required following metatarsophalangeal joint fusion. Dr. Rozbruch will begin by placing a small incision above the joint. The surface of the joint at each end of the bones will be removed. The surface of the bone on either side of where the joint previously was will then be prepared to fit into one another comfortably. Metal pins or screws may be used to attach these 2 bones together. Complete fusion of these bones typically takes about 3 months to occur. At the end of toe joint fusion, Dr. Rozbruch will close the incision with stitches. In some cases, Dr. Rozbruch may suggest a hallux rigidus surgery known as metatarsophalangeal joint replacement. An incision will be made above the joint to begin your hallux rigidus surgery. During toe joint replacement, the surfaces of the joint will be removed. These surfaces may be replaced with either a metal or plastic substitute. The surrounding bone (phalanx) will then be prepared to comfortably fit the artificial joint surface. Once the joint has been replaced, Dr. Rozbruch will close the incision with stitches. What should I expect after a hallux rigidus treatment? Patients may notice a relief of symptoms within a few days after a nonsurgical hallux rigidus treatment. Some anti-inflammatory medications may take 7 to 10 days to become fully effective. If you have received a Cortisone injection for hallux rigidus, results may take 24 hours to become apparent. Finally, any changes in footwear may take several weeks to months to become completely noticeable. What should I expect after a hallux rigidus surgery? 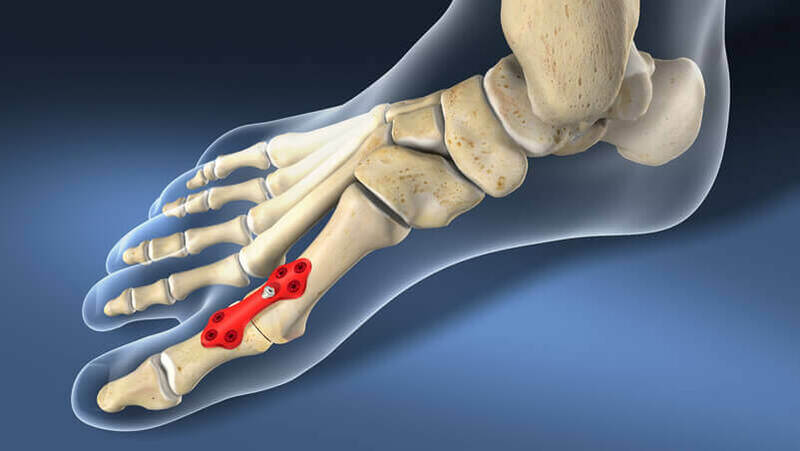 The recovery process and time for hallux rigidus surgery will vary depending on which surgery you undergo, your individual rate of healing, and the severity of hallux rigidus. In most hallux rigidus surgeries, it may take 2 months for the structures of the toe to fully heal. A cast or a shoe with a special sole may be prescribed following hallux rigidus surgery. Many patients may need to temporarily use crutches to walk until their foot has healed enough to support the weight of their body. Bandages must be worn for the first week after toe surgery. Any stitches may be removed within 10 to 14 days after hallux rigidus surgery. In some cases, Dr. Rozbruch may use dissolvable stitches, which will be naturally processed by your body following surgery. How can I learn more about hallux rigidus? To learn more about hallux rigidus, please request an appointment online or call Dr. Rozbruch’s orthopedic office in NYC at 212-744-9857. Prior to an office visit, please fill out Dr. Rozbruch’s patient forms to expedite your first visit.